Aquatint, 16 1/8”h x 22 3/8”w at neat line, 18 1/8”h x 23 ½”w at plate mark, plus huge margins. Vertical printer’s crease at lower center, a few pencil notes in lower margin (easily erased) and some minor edge wear, but about excellent. 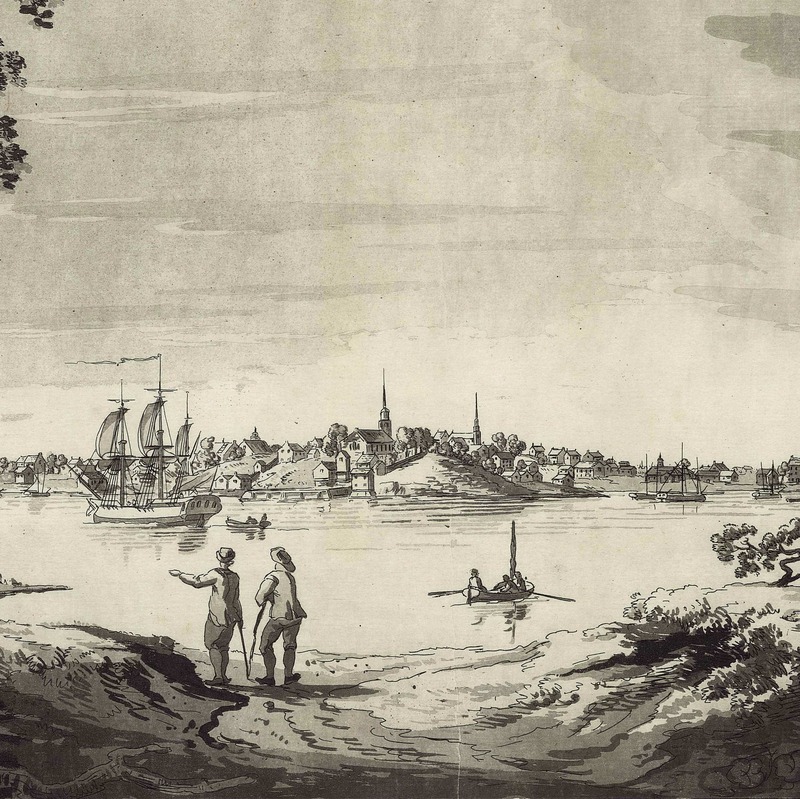 A very rare and quite lovely aquatint view of Portsmouth Hew Hampshire, which supplanted an inferior line engraving of the same subject in The Atlantic Neptune. 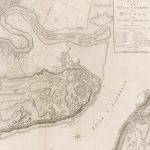 In 1764 the Lord Commissioners of Trade & Plantations appointed engineer Samuel Holland as Surveyor General of the Northern District of North America. 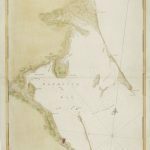 In this capacity he was charged with conducting “an accurate and just Survey… upon… a general scale and uniform plan” of the coast from the Gulf of St. Lawrence as far south as the Potomac River. Holland spent the next six years surveying Prince Edward Island, Cape Breton and other areas in and around the Gulf of St. Lawrence. Then from 1770-1774 he focused on the survey of the New England coast, during which time he made his headquarters in Portsmouth, New Hampshire. From there he sent out semi-autonomous survey teams, headed by his deputies Charles Blaskowitz, James Grant, George Sproule, Thomas Wheeler and Thomas Wright. All told, Holland probably had more than 50 men working under his direct supervision, in addition to the services of the sloop Canceaux, Henry Mowat commanding, who later became infamous for the punitive bombardment of Falmouth (now Portland), Maine. Holland’s finished surveys were sent back to England, where in 1774 Joseph Frederick Wallet Des Barres assumed responsibility for their publication. Given the unsettled times, the demand for finished charts was enormous, and his operation quickly grew to fill two townhouses and employ 20 assistants. While it was usually made up to order and therefore had no standard contents, The Atlantic Neptune ultimately extended to five sections: Nova Scotia, New England, the River and Gulf of St. Lawrence (based on the work of James Cook), the coast south of New York, and American coastal views. The latter included both coastal recognition views for use in navigation as well as line-engraved city views with a more decorative character. By the early 1780s, the Neptune was becoming an increasingly commercial enterprise aimed at a non-military market. In fact, Des Barres, who retained ownership of the atlas, would through the course of his very long life–just shy of 100 years–attempt to extract revenue from sales of the atlas while seeking further payments from the Crown. In keeping with the commercialization of the Neptune, Des Barres began replacing the line-engraved views with more refined versions in aquatint, a medium that enabled a skillful artist to achieve almost painterly gradations of tone and shading. The view of Portsmouth New Hampshire offered here is a very fine example of one of these later images. Holland had no doubt sited his headquarters in Portsmouth on account of its relatively central location, its role as a leading port, center of the lumber trade and emerging shipbuilding industry. He was also on excellent terms with New Hampshire Governor John Wentworth, who facilitated access to men and supplies, and who provided a steady source of land-based surveying work in the Winter seasons. At some point during this time in Portsmouth, Holland or one of his men—it is not known who—drew the town as seen from across Piscataqua Harbor. Some time around 1781 the view was replaced with this much larger aquatint. Here the city is set much closer to the viewer, yielding a more pleasing balance between the foreground and the town. The skyline is dominated by, from left to right, the South Congregational Church, Queen’s Chapel, and the North Congregational Church. What appears to be the Canceauxitself occupies the middle ground, towing a small boat. On the foreshore, the offending cattle are replaced by two gentlemen strolling, clearly in conversation. Thus, not only did Des Barres with this aquatint adopt a newer and arguably more sophisticated printing technology but also in the process greatly enhanced the aesthetics of the view. This impression is an early state, lacking the title found for example on the New York Public Library impression illustrated by Deak. 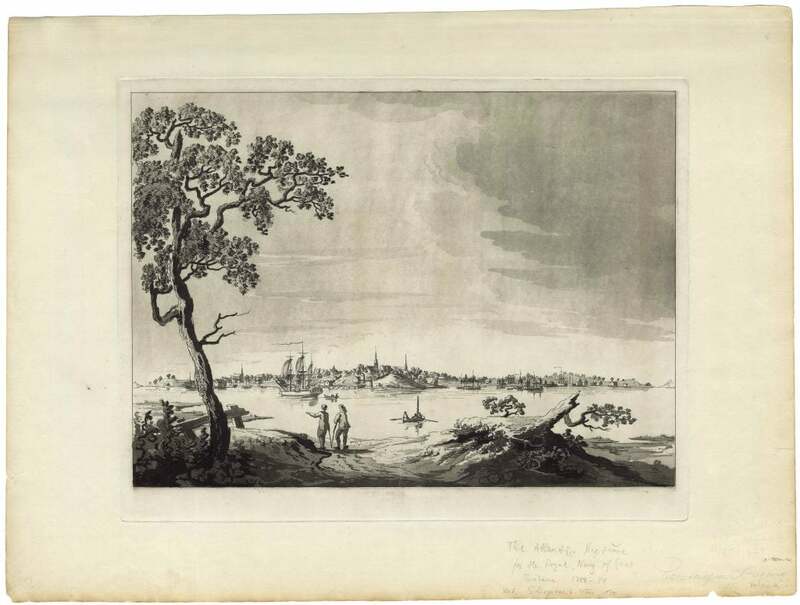 While the line-engraved view appears on the market occasionally, this lovely aquatint rendering is very rare, and I find no recent record of another having appeared on the market. Cresswell,The American Revolution in Drawings & Prints, #479 (illustrating the LC impression); Deak, Picturing America, #163 (illustrating a later state held by NYPL); and Stokes, American Historical Prints, B-71 and plate 26-a. 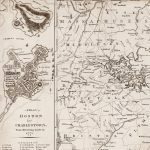 For background on the Holland’s Survey of the Northern District of North America, see Hornsby, N. Surveyors of Empire Montreal: McGill-Queen’s University Press, 2011) and Johnson, The First Mapping of America (London: I.B. Tauris, 2017).